I realised I hadn't posted any pages for ages! So here's couple from the last few days. The first one is using the new Papermania Love range, I love these, and think they go great with all sorts of other products - The papers and brads are my total favourites! Next is loads of Bampop and Hambley, I'm so in ove with both of these at the moment! The pictures are Martha having a Birthday ice cream! 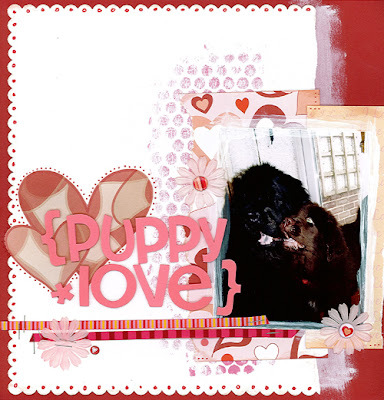 Love the Puppy Love page - great colours!